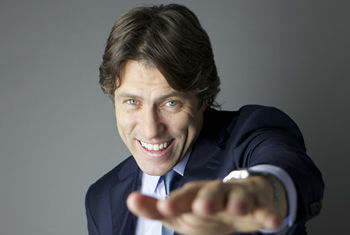 John Bishop - On sale now! Strap yourselves in and prepare for lift off; the countdown is on for the long awaited return of one of stand-up comedy’s biggest stars. Join John up close and personal on Thursday 9 October at St George’s Hall Bradford as he tries out new material in advance of his Supersonic UK Arena shows. After taking an 18 month break from comedy to write his autobiography, John is ready and raring to get back to where he feels he belongs – on stage, making people laugh. Not content with just writing his autobiography, John has squeezed plenty in over the last few years. In 2012, John performed to 500,000 people in his sell-out Rollercoaster tour. With its massive helter skelter set and surprise finale, the DVD of the show went on to top the charts. John ended 2013 with a Royal engagement with Her Majesty, when he hosted the prestigious Royal Variety Show before Christmas. He also hosted his own TV Christmas Special on BBC One. Before this, John starred in John Bishop’s Britain (BBC One) and John Bishop’s Only Joking (Sky 1). He cycled, rowed and ran from Paris to London in his one-off special for Sport Relief John Bishop’s Week of Hell (BBC One), and has been a regular on Sky 1’s A League of their Own in addition to hosting Live at the Apollo. The paperback version of John’s autobiography How Did All This Happen is published on 3 July. Do not miss this chance to see one of the country’s finest comedians in fantastic full flow in Bradford this autumn.